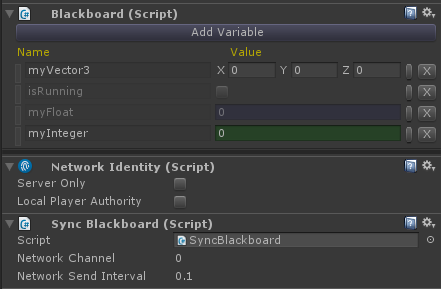 Blackboard Variables are possible to be synced across the network using the new Unity 5 system, UNET with ease. 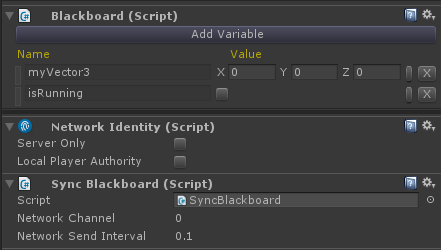 All you have to do, is to add the SyncBlackboard component on the same gameobject that has the blackboard you want to sync variables. Once that is done, all variable of the blackboard that are supported by the UNET system and that are not marked as protected, will be synced across the network. There is no extra steps needed at all. If you want to ignore a specific variable from being synced, you have to mark it as protected. This can simply be done so through the variables options button. Protected variables are also shown in transparent as a reminder. In the following example, “isRunning” and “myFloat” are marked as protected.